Hamilton Street has undergone the most change of any existing street in Geneva. (Lake Street went through the greatest change when it was eliminated in the 1950s with the creation of the 5&20 arterial east of the city.) Real estate and economics being what they are, the change continues. There are still a few glimpses of what the street used to look like and I want to document them before more time goes by. Hamilton Street was part of the stagecoach road from Utica to Buffalo. The photo below illustrates the poor street condition and the lack of development in 1877. There were some houses from South Main Street to west of Pulteney but the rest of the street was flanked by nursery land. 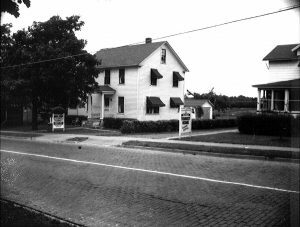 As nurseries began selling their land in the late 1800s and early 1900s houses were built on the western side of the city. This is noticeable on Washington, William, Castle, and Hamilton Streets. The 1949 photo above was taken in 1949 just west of White Springs Road. 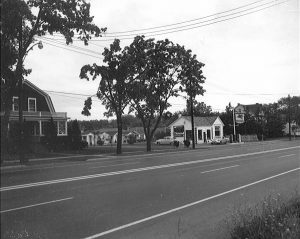 By this time Hamilton Street was part of State Route 5 and US Route 20, the major east-west road across the state, and the section between Canandaigua and Geneva was asphalt. The road changed to brick inside city limits which was probably a figurative and literal shock to motorists. 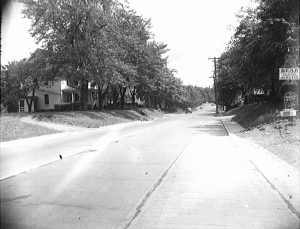 Also taken in 1949, the photo above shows the street as a quiet two-lane residential neighborhood. There was a commercial element as indicated by the tourist home signs. 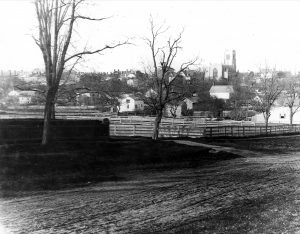 Hamilton Street, particularly near the Colleges, had many homes that rented out rooms to travelers. Tourist cabins offered more privacy than a room in one’s home. This cabin court was owned by the Cass family. Hamilton Street was widened to four lanes in the mid-1950s, changing the feel of the street. It has since been widened again to create a center turn lane. In 1957 the Town & Country Plaza opening began the large-scale commercialization of the street. 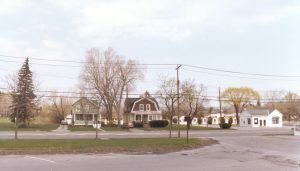 The Cass cabin courts and neighboring buildings, across the street from the plaza, remained intact until Wegmans built its store here in 1991. Over time the first several blocks of Hamilton Street west of Pulteney Street have become student rental houses. This house on the corner of Delancey and Hamilton Streets is still a single-family home and one of the more eye-catching properties. Set back from the busy street, it has a little more privacy but is also less noticeable as you drive by at 35 miles per hour. 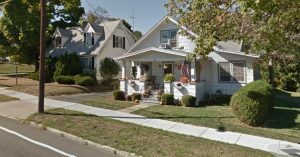 The Dutch Colonial Revival style was popular in the early 1900s when the street was being developed. There are few houses left west of Wegmans and the plaza. Of these two houses on the corner of Spring Street, the left-hand house is up for sale as commercial property. 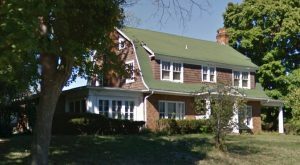 More modest than the Dutch Colonial Revival house, in the 1920s they were owned by the Kenny brothers who owned a nursery. There are two smaller houses on the south side of the street next to Tim Horton’s. This is still a residence while the one to its right is now a hair removal business. The last house on the street, next to Auto Zone, is more substantial with a brick porch, large support piers, and a large dormer on the second floor. Eventually these surviving houses will be gone. Heavy traffic makes the houses less desirable for several reasons and the owners may get more money selling to a commercial developer. 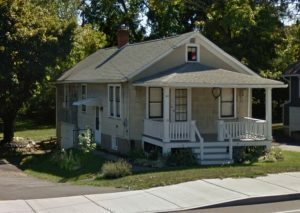 While historic preservationists won’t throw themselves in front of bulldozers to save these houses (nor do I think they should), it is worth noticing these houses and remembering when Hamilton Street was a solid middle-class neighborhood. 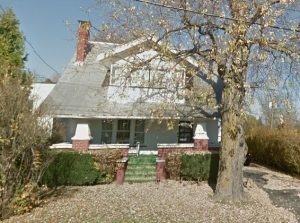 Do you have any info on 246 Hamilton St.?